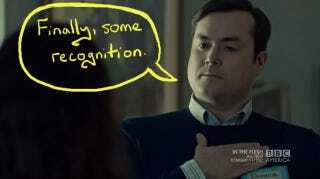 Somehow Donnie, Alison's hapless, terrible husband, was the star of last night's Orphan Black. Yes, he's still a moron and a sneak, but now we know that Donnie also has a heart—one that makes him do all the deliciously wrong things. Family Day is almost here and Alison and Vic are fake-bonding over the crafting table. Hoping to get the kind of dirt that Angie wants him to collect on Alison, Vic is yes-manning her and encouraging her to unburden her soul about Aynsley. It escalates quickly. But aww, she knitted him gloves! Making things truly how Alison expresses affection. And other things. Unfortunately, Vic is an even worse spy than Donnie was. He calls up Angie and talks about Alison with his room door open. Oh, Vic. Getting sober has done little to improve your intelligence. But it also turns out that he's not that wed to the idea of snitching on Alison, not if Felix can get him in a room with Sarah. However, Sarah is kind of busy these days. Sarah and Siobhan have some big decisions to make regarding Ethan Duncan, namely what to tell Rachel. Siobhan does some very daring recon and walks right into Leekie's office, telling him that she has Ethan's missing research. Any lingering thoughts I had about Siobhan being the original are gone; I doubt that Leekie would have been so placid if the source of the original genome had just waltzed into his domain. He has heard of her, however, perhaps merely as a thorn in Dyad's side. But he more or less confirms what Sarah suspected: that he never told Rachel about his role in her mother's death. Rachel is in for a simultaneously nice and nasty surprise. The confirmation that Ethan Duncan is truly alive prompts Leekie to contact someone we haven't met before: Marian Bowles. There are a lot of small moments about parents and children in this episode: Paul comments that Sarah gets her habit of tearing things down from Siobhan; Kira, even after snubbing Sarah, calls out for her mother in her sleep; Rachel reunited with her father and shows Leekie an ounce of mercy because he was her surrogate parent. And with Marian's proper manners, removed demeanor, and fabulous coat, it's hard not to see her as a sort of proto-Rachel, perhaps the woman that Rachel ultimately modeled herself upon in the absence of her own late mother. Sarah does take a moment away from her intrigue to rescue Alison. At first, it seems that Vic genuinely wants to make amends, but he quickly shows his true colors. He wants Sarah to apologize right back to him (well, she did steal his drugs) and he wants back into her life. Really, Vic? You seemed so much happier at the end of last season when you had allegedly given her up for good. Plus, I don't think you have the stomach for all this Dyad stuff. Oh, but Felix drugged his tea. It's a pretty nasty thing to do to a sober person, but I still laughed when he fell face-first into Alison's crafting supplies. It's especially grand during the role-playing session. Sarah has spent most of her life conning people. She has successfully convinced people that she was Beth, Katja, Cosima, and Alison. But even she can't handle pretending to be Alison pretending to be Donnie. It's comically reminiscent of Sarah and Donnie's encounter in the craft room. Donnie's cluelessness quickly melts into defeat when he is finally let in on the show's big secret: his wife is a clone. For the longest time, I've thought the worst of Donnie. I thought that, like Paul, he had been blackmailed into watching Alison. After all, he and Alison broke up in college and then later got back together. But it turns out that all of the spying, all of the sneaking around and lying, burning his stuff in the backyard—Donnie did all of that simply because someone asked him to. He didn't know that people were violating the sacred threshold of his home. He wasn't building a fraudulent life around two children and a big home in the suburbs. He did all of this because his sociology professor told him he was contributing to science. I guess we should be glad his professor wasn't Stanley Milgram. Perhaps Donnie's eagerness to kowtow to authority is not that different from the reason he married Alison. He's a guy who likes to be told what to do. He was happy in his prescribed life with his kids and his big house. 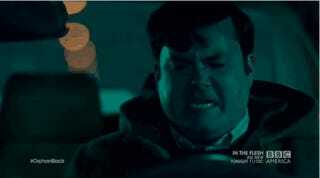 But like Alison, he now knows what it's like to have his sense of reality betrayed and realizes that his relationship has been forever tainted by Dyad. To his credit, he comes across as heartbroken more than anything else. He loves Alison and he was duped into hurting her. Meanwhile, things have gotten serious at Dyad. Cosima has learned about the origin of those stem cells (which came to Dyad via Kira's accident rather than through Siobhan) and she rages at Delphine's paternalism. Delphine is another heartbroken monitor, and Leekie knows that she can't bear the thought of losing Cosima. By herself, Cosima would never consent to having Kira brought in for more stem cells; making her own choices about her biology means deciding not to risk anyone else's freedom. But Delphine's growing desperation makes that harder for Cosima to let the disease take her. And Sarah's sororal love for Cosima is so strong that she's willing to bring Kira into this mess—something she has avoided for so long—but is she counting on Rachel to protect them? And what does Cal know at this point? He seems on the verge of saying that Sarah is a clone, and he has certainly been doing his research into Dyad. But the big Dyad moment happens between Rachel and Leekie, when Rachel makes it clear that Dyad is ready to kill Leekie for his interference. It's interesting that Marian seems to issue the kill order, especially since Leekie felt the need to tell her that Ethan Duncan was alive. But Marian's job may be to keep her peons in line more than anything else. Rachel decides, however, that she has enough affection left for Leekie to give him a shot at survival. The resurrection of one parent doesn't soften the blow of losing another. Unfortunately for Leekie, the first person he runs into outside Dyad is Donnie with a loaded gun. Now maybe Donnie's reaction to the big clone reveal should have been a huge apology to his wife and a promise that he would try to rebuild their marriage. But at the moment, he's beyond hope. He feels like he has wrecked his marriage and he doesn't even understand why. "Yes, Donnie!" I found myself shouting at the screen. "You take control of your life!" You would think at this point that Leekie might have a stronger sense of self-preservation, but instead he ridicules Donnie, claiming that Donnie's little life is nothing compared to the importance of the Dyad's big science. That just leaves Donnie more upset…and…. Okay, I am a terrible person, because I laughed at this. I laughed at drugged Vic, and I laughed even harder when Leekie's head exploded all over Donnie's window. I may have even clapped a little. It was just so absurd. Last episode, I was wondering if the Neolutionists were somehow the big bad within Dyad, but this episode showed me just how wrong that was. Not only does the Dyad rabbit hole go much, much deeper—I imagine that Marian is just the beginning—but Leekie is such small potatoes in the grand scheme of things that they let Donnie of all people kill him. Man, Donnie, I don't want to be you right now. Rachel is going to be pissed.